For years, novelty phones appear on Brittany's beaches - but the source is finally found. A French coastal community has finally cracked the mystery behind the Garfield telephones that have plagued its picturesque beaches for decades. Since the 1980s, the Iroise coast in Brittany has received a supply of bright orange landline novelty phones shaped like the famous cartoon cat. Anti-litter campaigners have been collecting fragments of the feline for years as they clean the beaches. But now, the source of the problem has been found - a lost shipping container. 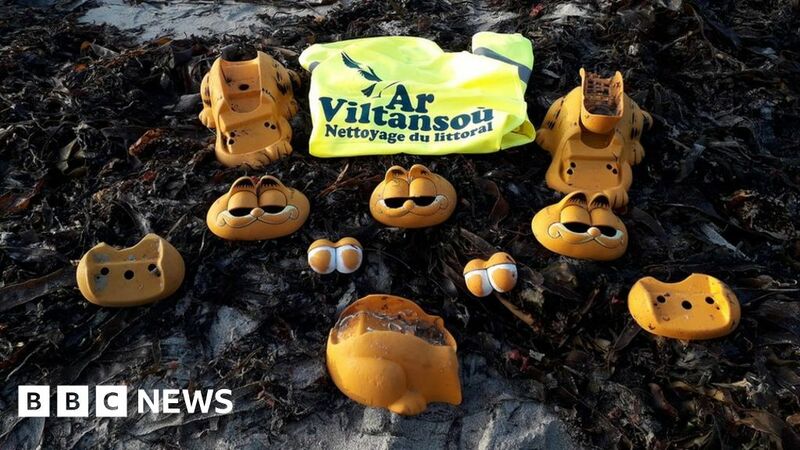 Last year, campaigners from the Ar Vilantsou anti-litter group made the novelty phone a symbol of the plastic pollution on the beaches of the Finistère region - part of which is a designated marine park. Once a common household item, its eyes open when the landline receiver is picked up, and thousands were made and sold during the 1980s. Collectors still buy and sell the vintage Garfield phone online today. The beach-cleaning teams had long suspected that a lost shipping container - perhaps blown overboard - had regurgitated its precious orange cargo. But they had never been able to find it. The media attention on the new campaign, however, drew the eye of a local farmer who remembered the first téléphone Garfield appearing after a storm in the early 1980s, when he was a young man. He also knew the location of the container - in a secluded sea cave accessible only at low tide. "You had to really know the area well," he told Franceinfo, which had covered the campaign. "We found a container aground in a fissure. It was open. Many of the things were gone, but there was a stock of phones," he recalled. Members of the Ar Viltansou group, accompanied by Franceinfo journalists, set out to find it. Climbing down the slippery rocks to the cave, the team spotted remnants of a destroyed shipping container - and soon, between the rocks, Garfield phones - in a more complete condition than any found before them. "This is the first time in our lives that weʼve seen that," campaigner Claire Simonin-Le Meur told the reporters. Inside the rock fissure, they found orange plastic poking out from beneath the rocks. The container appeared to remain somewhat buried after three decades. The challenge of plastic pollution - a hot-button political issue over the last year - is not necessarily reduced by solving the mystery. The container remains inaccessible and it is not known how much of its cargo is sealed within it. Another issue is that the novelty items that escaped and continue to wash up on Brittanyʼs beaches will not decompose in a human lifetime. In the meantime, both Ar Viltansou and local officials say they will continue to harvest Garfields from the coastline.